Harvey Penick had his famous little red book of thoughts about life and golf. Let me tell you about my little green book, Beyond the Score. For me it is much more than a book about golf, it is a book about relationships - horizontal relationships with other people and the vertical relationship with God through Jesus. Such an important topic should take more pages, but I cut out the fluff and gave you the best stuff in a crisp, easy to read, beautifully bound book of just 93 pages. Beyond the Score won't improve your golf swing or your handicap. It will tell you how to meet and treat people on the golf course and off so that you can have an impact in their lives. In so doing you will help them meet their goals and achieve your own in the process. My goal is to share this message with as many people as possible. 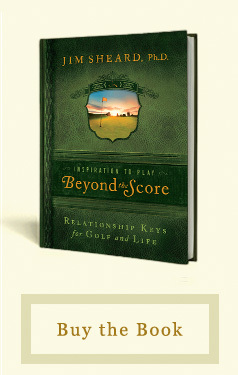 I hope you will buy Beyond the Score, share it with your friends, and give it out to participants in your next golf event. The Store page will show you how you can do that.